The ESA has released an unprecedented close-up view of comet 67P and a description of its surface features. An intricate picture, delivered by the Rosetta space mission, raises new questions about the origins of the Churyumov-Gerasimenko comet. Initial results from seven of Rosetta’s 11 science instruments, which collected data during the approach to and upon arriving at Comet 67P last August, were published in a special edition of the journal Science, the European Space Agency (ESA) said in a Thursday press release. READ MORE: 'Rotten eggs & horse pee': Rosetta probe sniffs comet 67P…and it stinks! Firstly, the “rubber duck” comet, so called due to its dual-lobed form, was measured. The total volume of the comet is 21.4 cubic km with a mass of 10 billion tons, constituting a density of 470 kg/m3. The scientists assume that the comet, which weighs nearly 100 million times more than the International Space Station, is incredibly porous, as it is composed of ice and dust. 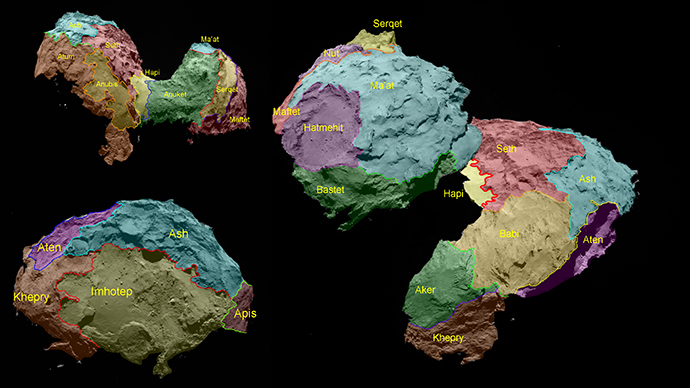 Seventy percent of the comet so far has been imaged by the OSIRIS scientific camera, which allowed scientists to identify 19 regions based on the type of dominant terrain. These regions were named after Egyptian gods – for instance, dust-covered Ma’at, Ash and Babi, located in the comet’s northern hemisphere. As the comet travels towards the Sun, thus heating up, its ice turns into gas, forming the atmosphere, or coma. The gases released from the nucleus also produce dune-like ripples, collecting and transferring gas across the surface. “We're taught that comets are made mostly of ice. For this comet, the coma sometimes contains much more carbon dioxide than water vapor,” said Rosetta scientist Stephen Fuselier, as cited by Reuters. Studying the comet, scientists were surprised to find mostly simple hydrocarbons, while expecting more complex carbon-containing molecules. They were also excited to observe the changing of the seasons at the surface of the comet, as the comet approaches the sun. In November, the Rosetta spacecraft released Philae, a washing-machine-sized probe that landed on the comet’s surface. It is in a state of hibernation now, and the data from its experiments is pending, as there was not enough solar energy in its batteries to carry on exploring the comet. The Rosetta mission began 10 years ago, and its space voyage commenced with three flybys of Earth and one of Mars. It has been orbiting the comet since last September, and “woke up” from a two-month-long sleep just this Tuesday. It’s destined to shed light on the processes of comet formation and evolution, as well as the solar system’s origins, studying a chunk of what is believed to be frozen leftovers from the process of planet formation about 4.6 billion years ago. Comet 67P is a periodic comet with an orbit of 6.5 years that belongs to the Jupiter family. It will approach the sun at its closest in August, staying some 186 million kilometers away from the celestial body. Comet Churyumov-Gerasimenko was named after the Soviet scientists who discovered it in 1969.